Styles #2 & 4 are my current front runners..... and then I need to determine which color, each of these come in both brown and black and I can think of 'reasons' I need a pair of each color! I have a feeling the annual boot debate is common amongst my shopaholic-lady-friends (ie YOU! ), am I right? Which would you choose? I am having the same issue! I think I am liking the taller heel because I am such a shrimp. I love 1 and 3! So cute. I actually love #3, really all of them are cute! #3 is my favorite! I would go with black, I have black booties that I wear constantly! 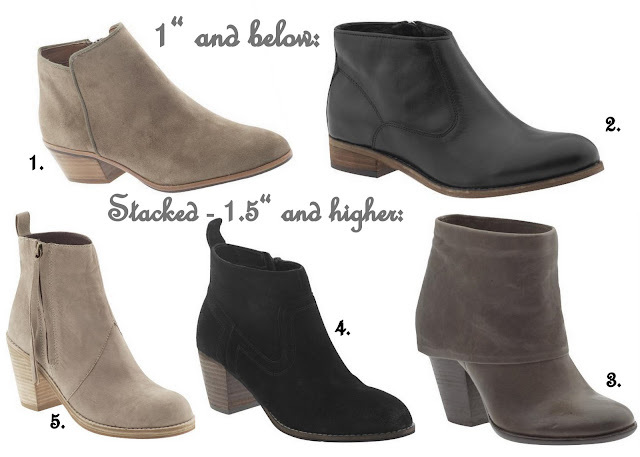 I love #4...I go for the stacked heel! Oooh... decisions, decisions! I want #4!!! those are all really cute, but i'm loving #3!! I like the taller heel! But they are all so cute. #5 is my fave. Ooo, 1 and 4 are my favorites. Love dem boots! I'd go with #2 in brown and #4 in black...but I pick those colors only because I always muck up my suede shoes and black ones tend to look better for longer....and it seems that #2 is leathery. Ahhhh now you've got me in a boot shopping mood...spent all of Sunday at Old Orchard and didn't find a single pair to try on. Okay. So I saw the #4 up close and, uh, BORING. You have too much sass for those. I think you need the 1 and 5, and get the 5 in black. Seriously thought. Those 2 are totally you!! I rifle w/this same problem, good to know it's common! I've been wearing a low heel bootie the last 2 years and now I think I am ready to try a higher heel. Like all these styles except for the thick cuff (last one). Love #4!! Sigh, it's perfect. I'm partial to the one with a heel and my favorite is #5. It just seems great for a city gal. I have also been on the hunt for a good ankle boot, but I always seem to have the issue of finding the right heel and having too much room around the opening circumference. I have the same problem! Love #4 though! ooh i love how you did them by heel height! so smart! ive had my eye on those sam edelmans. i really love the shape! I've been looking for a great, comfortable ankle boot for the past two years...#4 seems like the best bet to me!! LOVE #1 and #4! Which ones did you end up getting? Any yet?? I am honestly having the same problem right no. I love both styles, but can't justify buying both. I really like your stacked heel picks, I think they could go with so many outfits. 4 and 5 are my frontrunners! i was JUST asking myself that the other day - how many black boots is too many? i feel the need to purchase a pair of tall black boots every year. Shop boots in Chicago at CITY SOLES in Wicker Park!